Todolwen: 'Being Inspired' ~ Bold and Vibrant ..
these past few days I have been busy working on one of the elements for my newest creation. They were very lovely but in need of color, something a little dyeing would soon have fixed. I say this so often ... you know, the thing about me and colors and that we don't mix very often but once in a blue moon I will just pick a color and work with it. The very first time I dyed my crochet violets, I used raspberry tea but after a while the color faded. The second time I used Easter egg coloring but that is always a hit and miss with how it might dry. Some times it would dry purple but other times it would turn out pink or blue or all three of them together. This time I decided to use rite fabric dye and it proved to be the right way to go. I was 'brave' and went all out with color ... vibrant and bold! 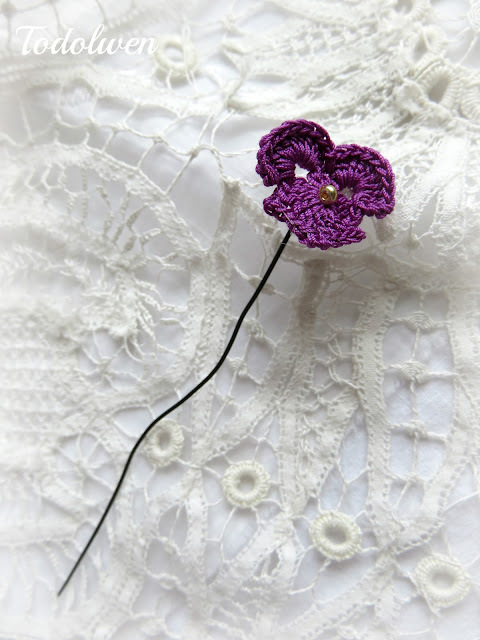 It almost felt like my little flowers came alive (figuratively speaking) ~ take a look! ... and here they are in the new 'dress' ... just love them! And since I had the fabric dye ready in a bowl, I didn't want to waste it. Remember waste not, want not! I went on the search of what else I could dye purple and of course one of my favorite things came to mind ... drop cloth, it was a simple must for me. The other thing that was a must for this color bath was seam binding. Everything just took to the lovely color and each item took to it differently. I made them grow on thin stems of old wire and I am so pleased how they now look. 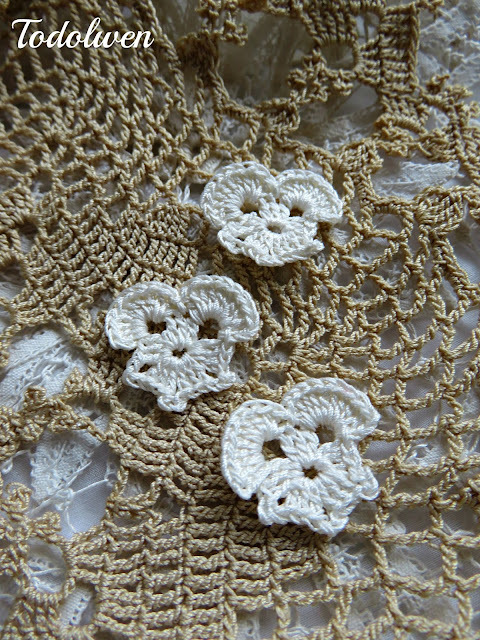 I have some more to do and then I can start working on the next element to this creation which will be some little leaves for my small blossoms but that will be for another post. Thank you for stopping by today and visiting me here at Todolwen. Do stop by again if you have a few spare moments and see what else I might just have to share. How pretty your wee violets are. I look forward to seeing the finished project. Ahhhh... love this color very much! 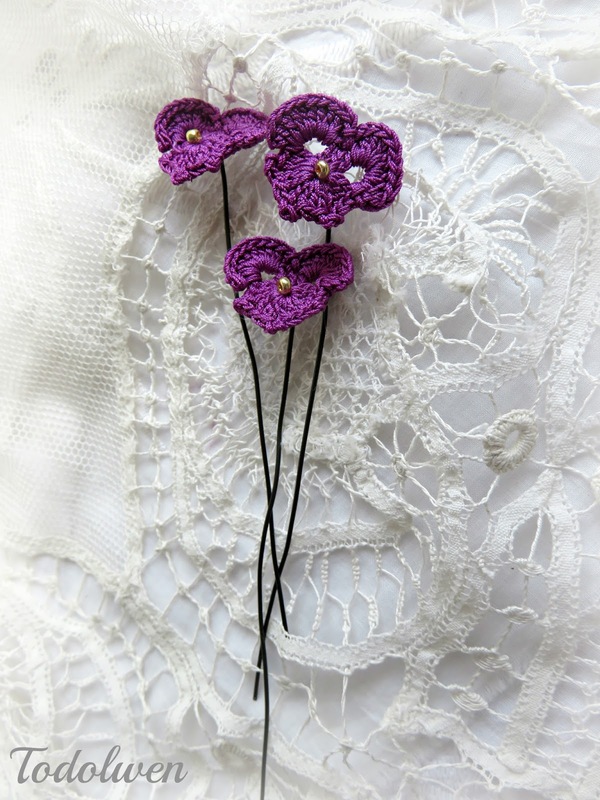 The violets are superb - I must learn to crochet properly. You are an inspiration! Thank you. How pretty you have made those little violets. Look forward to seeing how you use them. Pretty violets, they looks so fine. Your little violets did look so pretty in white, but the purple really did make them come to life. Curiosity abounds to see what you will do with them! 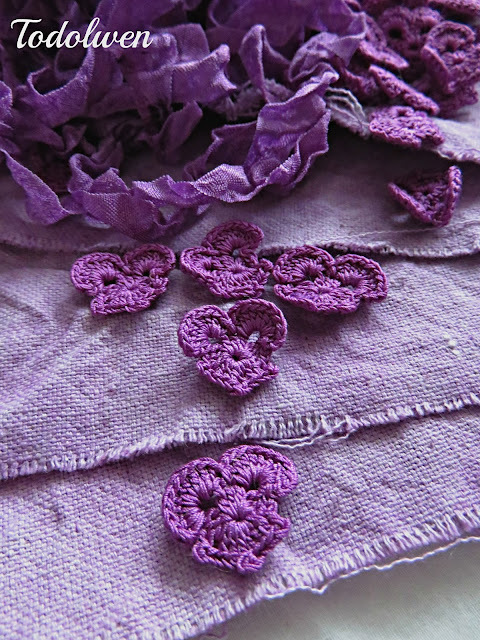 Violets are a favorite of mine...looking forward to seeing how this all turns out. I wish my mother was still alive so that she could see these. Her favorite flower!!!!!!!!!!! Hi Karen! 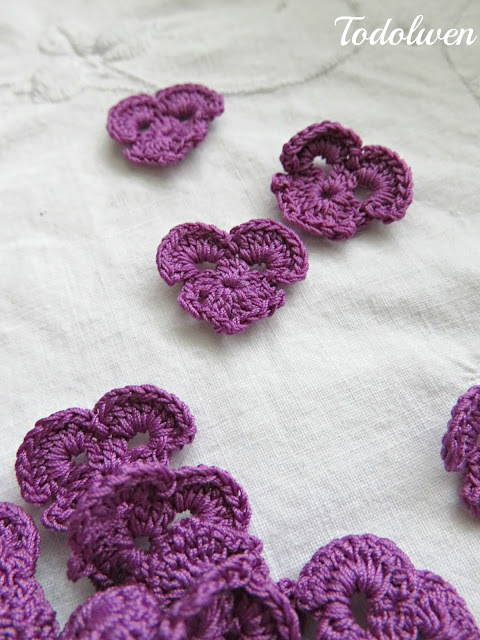 I LOVE your violets! Beautiful! The color is fabulous too! QUe bonitas quedan esas violetas de ganchillo!!! Finding the right shade of purple is hard but I think you hit the nail on the head. These are so pretty.